The traditional season-opener, celebrating legendary Liverpudlian coach Soens, reaches its half-century on Saturday and organisers are expecting a record-breaking number of entrants. One hundred and fifty one riders have already registered and at least a dozen more are expected to turn up and enter on the line. Four-time winner Tony Gibb is expected to be racing at Aintree, alongside the likes of Andy Tennant (Rapha-Condor-Sharp) and Tom Murray (Sigma Sport-Specialized). The elite riders will be keen to wrest back control of the handicap race after last year’s unusual events. The juniors tore round the early laps to gain a lap, and teenage Motorpoint rider Josh Edmondson took the win in one of the biggest upsets the event has seen in its long history. 2009 winner Ed Clancy has decided not to race as he recovers from a cold. 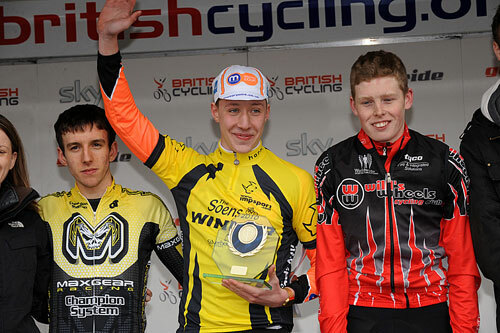 The 2010 Eddie Soens podium was made up of three junior riders, with Josh Edmondson the winner. Team Cyclepremier.com-Metaltek officially launched for its second season of racing on February 28. Their line-up is a significant expansion on last year’s side. Six riders remain on board, while team director Rod Freeman has brought in additional riders from several bigger British teams. These new signings include Ross Creber from Endura and ex-Raleigh man Dale Appleby, the Welsh road race champion. The team got off to a good start to the season last weekend at the Clayton Velo Classic, with Tom Barras finishing in third to a Dean Downing-Tom Murray tied first place. They will also be appearing at the Eddie Soens Memorial Race tomorrow (Saturday). The full Cyclepremier.com-Metaltek line-up is: Richard Hepworth, Ross Creber, Jason White, Tom Barras, Rachel Paling, Bradley Burbridge, Andy Swain, Simon Wilson, Matt Rowe, Dale Appleby, Ashley Finn, Tony Gibb, Robert Smail, Rod Freeman, Simon Ward, Stephen Gallagher. Wouter Sybrandy (Sigma Sport) says he is optimistic about defending his title at the East Surrey Hardriders Time Trial this weekend. The race, which forms part of the RTTC-Rudy Project time trial series and takes place in the Dorking/Reigate area of Surrey, is being run for the 47th time on Sunday, and the Dutchman has his sights on breaking the course record. Last year, freezing conditions didn’t stop Sybrandy winning – and finishing just nineteen seconds behind Matt Bottrill’s course record of 1.07’25”. Sybrandy feels he is in good enough condition to break that this time around. “After our training camp in Tuscany, I knew my time trialling form was OK, but my results so far this year definitely have surprised me. “I’m riding a lot better than I expected and if I can take that into the race, I think I’ve got a chance of setting a new record,” he told Cycling Weekly. Having already triumphed in the Southdown Bikes events and the Redhill Sporting TT, he has Bottrill’s time in his sights. “I’ve been looking at the course details this week, and I’m hopeful I can post a one-hour 7 minute time. Obviously if I can break the sixty-six minute mark, then I’ll be delighted. Skyes sprinted to victory in the 105km circuit race around Avonmouth last year, and will have team-mates Simon Richardson and Steve Lampier for company in the popular Welsh event. Team UK Youth’s James Stewart and Grant Bayton (Wilier/LifeCare/GoSelf) took the minor podium positions in 2010, and will look to beat Sykes this time around. Motorpoint’s Will Bjergfelt will also be a man to watch, as someone extra motivated to win on a circuit miles from his front door. Steve Thomas (Bristol Road Club) will also be riding, having taken part in every edition of the race for the last 25 years. The national road race isn’t till June 26, but there are already eight keen riders who have got their entries in nice and early. Among the octet are reigning junior national champion Dan McLay, who is spending the year in Belgium with the Omega-Pharma Lotto development team. Academy riders Tim Kennaugh and Chris Whorrall are also on the list. The Manx pair are racing for Italian team MG Kvis Norda Pacific this season. Former amateur boxer Jim Doyle is riding this year’s Race Around Ireland in the hope of raising money for the Children In Crossfire charity. Doyle turned to cycling six years ago, and is looking at riding “Europe’s toughest cycling challenge”, comprising of 1350 miles, in just four-and-a-half days. His fundraising exploits are being supported by The Undertones drummer Billy Doherty, who knows Doyle through the Derry-based Foyle Cycling Club. Organisers of the Yorkshire Wolds Cycling Challenge have released the details of the inaugural event to be held this summer. The ride (16- 17 July) is being held to coincide with the launch of a new 150-mile cycling route in Yorkshire. Starting and finishing in Norton, organisers are hoping to attract 250 cyclists to take part, along with raising £10,000 for the Ryedale Special Families charity. The pathway takes in mainly minor roads, and is being supported by Visit Hull & East Yorkshire and Ryedale District Council.